Charity is not solely the domain of the devout. While religious organizations indeed greatly contribute to the social well-being of their communities through encouraging people to volunteer their services (see chapter six, page 87), non-religious people share and fulfill a great deal of the burden to offer charity. Indeed, while non-religious people tend not to offer charity as often as believers, when they do they give more (see page 4). This post is not to discuss the contributions of believers and non-believers; it is to discuss the benefit for everyone to volunteer their time or their money. This post serves to encourage charity from both believers and non-believers. I have an impressive (I’m so humble, aren’t I?) history of volunteer work. I’ve donated over 400 hours to PETA, doing everything from research to stuffing envelopes. I dedicated a year to Operation Smile, primarily helping to organize high school and college sports events that raise money for the organization. I served on a board of directors for a state-level non-profit organization to end capital punishment, mostly in major and planned giving. And currently I volunteer at an organization that raises money for ForKids. My contribution to this group is less impressive; I mostly sort through and organize donations of clothing. I’ve actually run out of space on my resume to adequately discuss my professional experiences with these groups. Why am I bragging about my volunteer achievements? Two reasons, first because I earned them. And second, to convince you to earn the right to brag about your own volunteer work. Besides the inner fulfillment volunteering brings, volunteering also has many great benefits to the individual donating their time. For example, it’s a great way to pad your resume with relevant experience. Just out of college and have no work experience to report to future employers? Volunteer two to ten hours a week and your resume will build itself without much effort. In many cases, one need not even apply to volunteer; just show up!! Another benefit comes to those who’ve either been fired from their job or are on layoff status. Potential employers want to know how you’ve kept busy during your unemployment period. Volunteering is a great way to tell the hiring manager that you didn’t sit at home sulking, feeling sorry for yourself for losing your job. It tells them you’ve been active and used your unemployment as an opportunity to give back to the community. 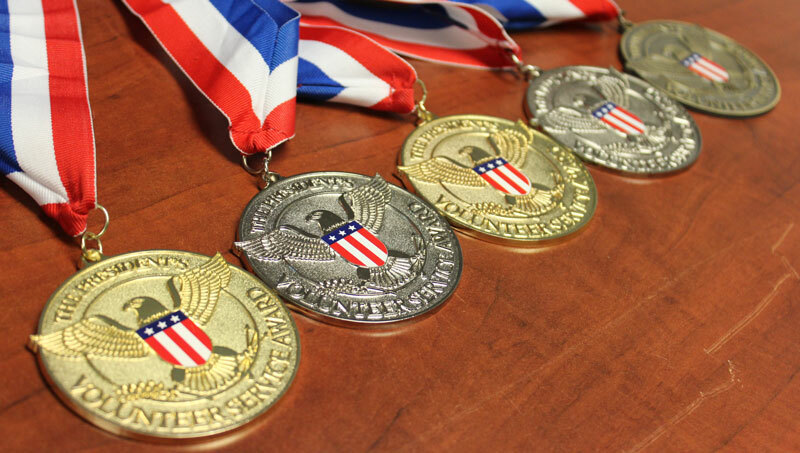 Finally, volunteering can earn you a medal from the President of the US (if you live in the US). Just volunteer at least 100 hours during a 12 month period, and the White House will send you a freakin’ medal!! That’s something impressive you can show off to your buddies (and inspire them to volunteer too)! Plus, it looks really good on your resume. If that’s not enough to convince you to volunteer your time (or money) to help your community, then I hope that your communities’ needs for volunteers is compelling enough to convince you to sign up. And if you’re an atheist, volunteering is a great way to remind your religious counterparts that morality and ethics don’t belong strictly to the teachings of the church. Atheists are not heartless bastards. We actually care about our communities, and we’re willing to get our hands dirty to prove it. This entry was posted in Atheism and tagged Atheism, charity, God, non-profit, Religion, Secularism, volunteer work. Bookmark the permalink. Social justice is an important part of being human. I hate it when people say “social justice warrior” like it’s a bad thing to try and make the world a better place. I also get annoyed when atheists brush off social justice with the line of “it’s not part of what it means to be an atheist.” So because social justice isn’t defined within the word “atheism,” you can’t do any social justice work or be pro-social justice? We all live on this planet together, and we all rely on one another. That’s why my club decided to organize a conference on the intersection between free thought and social justice. We decided it’s time to encourage others to get involved. Very true words. I couldn’t have said it better myself.